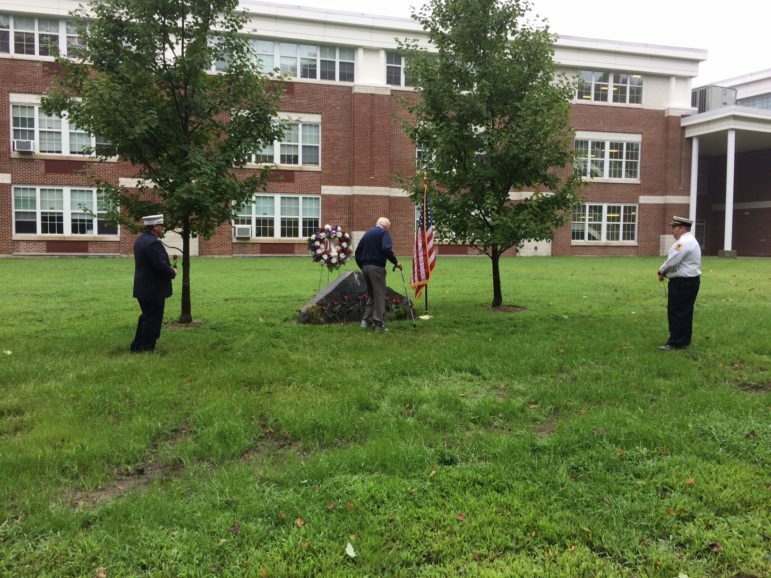 A brief ceremony was held at Darien’s 9/11 Memorial Tuesday morning, the 17th anniversary of the Sept. 11, 2001 terrorist attacks at the World Trade Center and other massacre sites, resulting in the deaths of thousands, including some from Darien. 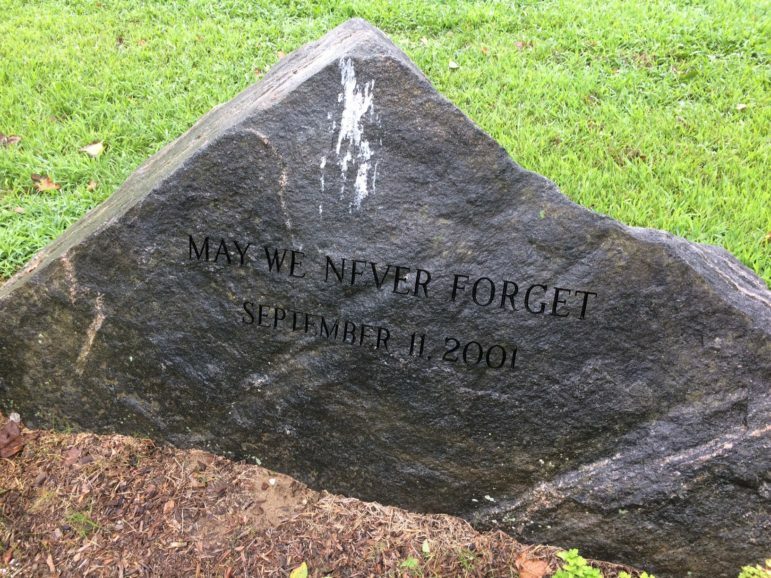 About 50 people, including numerous firefighters and police officers, attended the event at the memorial site, an engraved stone flanked by two trees (symbolizing the World Trade Center’s Twin Towers). A moment of silence was observed at 8:46, the minute that the first plane struck the World Trade Center. 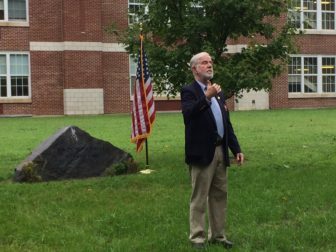 He noted that everyone at the ceremony would remember where he or she was on first hearing the news of the attack, and he recounted how Darien reacted to it and how a boy scout, a year after the event, decided to push to get a town memorial built. In doing so, Kraft indicated that 9/11 wasn’t just about the loss and the shock of the loss, but about resiliency in the face of it. 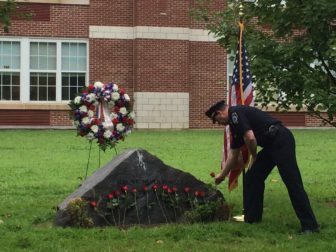 The placing of roses at the memorial — now a Darien tradition at the annual 9/11 ceremony. “Everybody had something to do right away,” Kraft recalled. “I know a lot of our first responders, a lot of our firefighters, got on the highway and went down to Manhattan, as far as they could. Some made it. 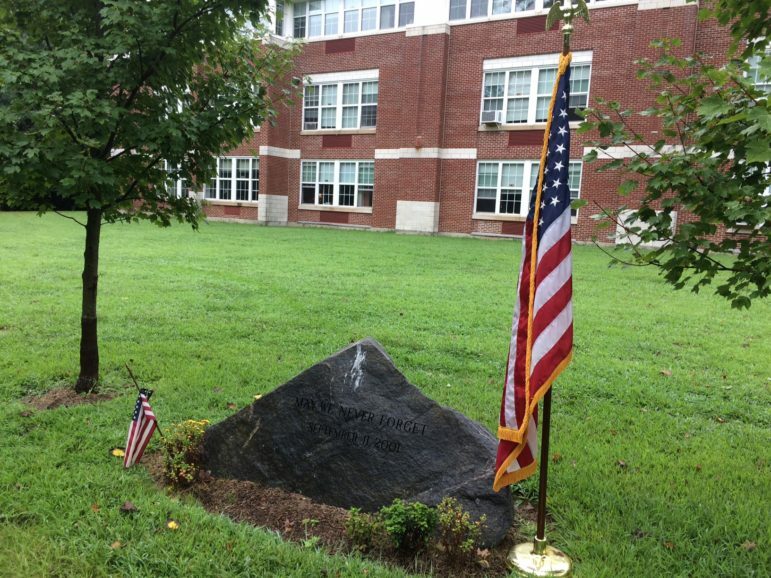 “In the days following, under the leadership of [then First Selectman] Bob Harrell, Darien mobilized, gathering goods, money, whatever it took, to support those who were still recoiling from the horror. […] On the 25th of September, we had a rally around the firefighters monument. We had tables, we had people […] advising us on what to do — grief counseling. We had people collecting items — collecting batteries, collecting water. Lots and lots of water. “Every newspaper was publishing special editions with flags inside the newspapers […] so you could put that in your window. The town ran out of flags. The VFW ran out of flags. My charity, HonorBound Foundation, ran out of flags, because everybody wanted to make sure that we stood in solidarity. “A year after a young man named Josh Doying noticed that the flag that was on his window had gotten kind of crusty and brown. 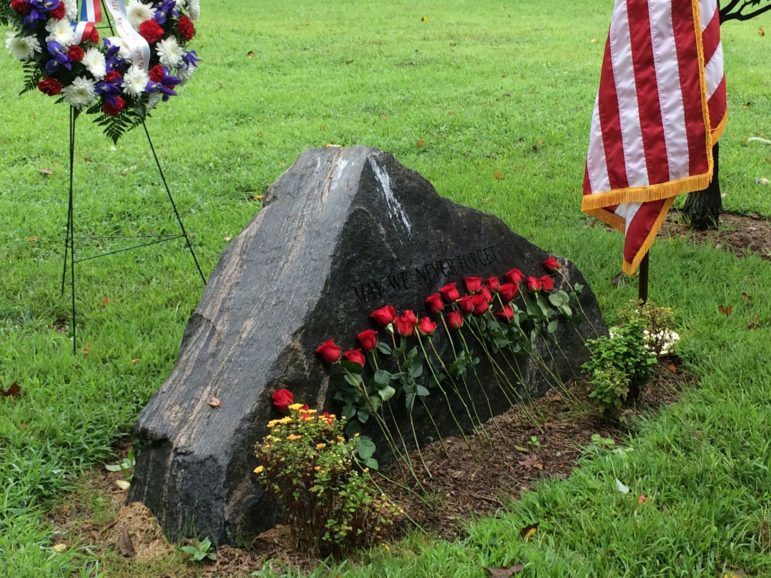 […] He realized that it’s going to be really easy to forget if we let things get crusty and brown, if we let things get crispy, so he immediately started his project, right behind me here.” Kraft indicated the memorial he was standing in front of. 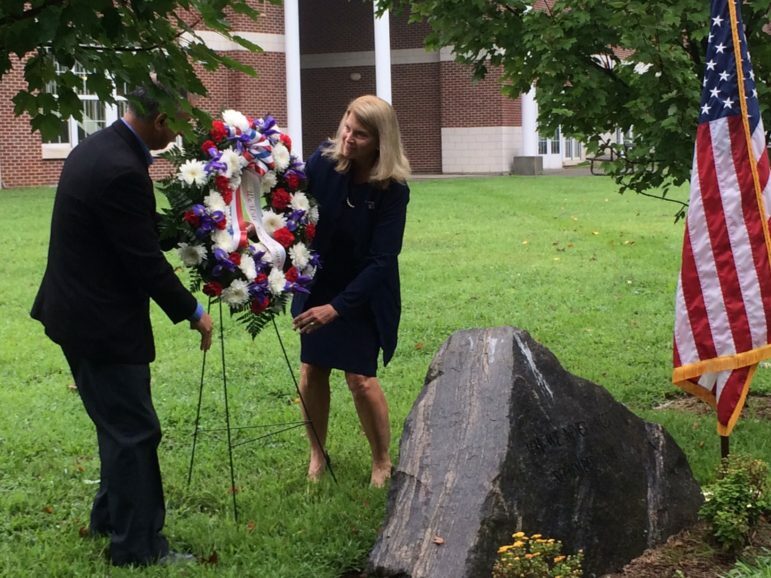 First Selectman Jayme Stevenson and state Sen. Carlo Leone placed a wreath just behind the memorial, and both placed long-stemmed red roses against the stone. Roses were then placed by more than a dozen other people at the ceremony, which took less than 20 minutes from start to finish. The Darien Police Department is a proud supporter of Autism Awareness Month. Throughout the month of April, we will be joining hundreds of other agencies across the country in displaying a special Autism Awareness magnet on our police vehicles as part of the “Autism Patch Challenge.” — an announcement from Darien Police Department The Autism Patch Challenge began in 2017, and originated in New Rochelle, New York by New Rochelle Police Detective Chris Greco in honor of his son, Christopher, who is non-verbal. Greco has created a charitable foundation, “Christopher’s Voice,” which provides various support options for families with autism, and focuses on emergency responders.